PROCESS magazine Vogel Media present the Innovation Award at POWTECH/TechnoPharm. The award honors the most innovative equipment and processing in several different categories. One of them is: Particle/Material Analysis and Characterization. Since the award was established we applied now 5th time. Three of the four products we applied for so far, made it to the winners rostrum. 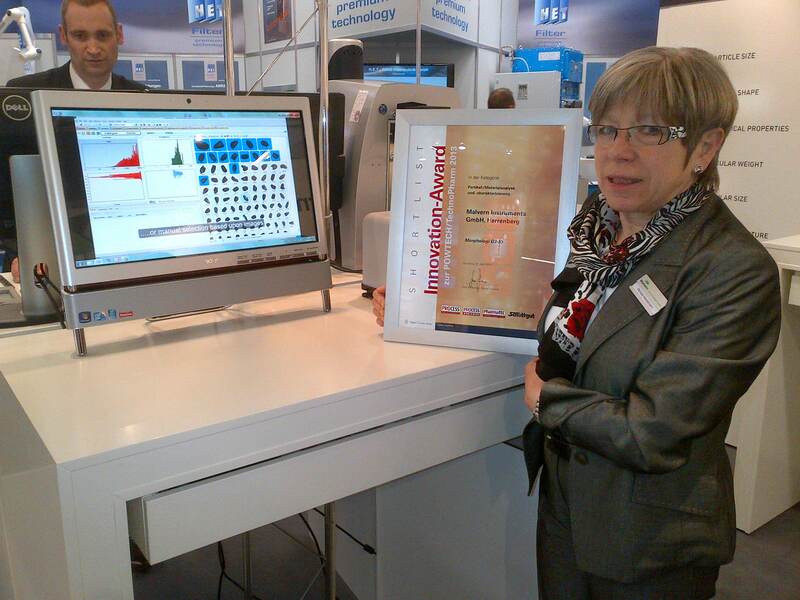 2007 we won with our first chemical imaging system. 2008 we made it to the shortlist of the best three with our Kinexus rotational rheometer. 2011 we won again with our Mastersizer 3000. So expectations for 2013 have been very high. It started already when we had to decide what system we will present, the Zetasizer Nano ZSP and the Morphologi G3-ID fulfilled the requirements list. Finally we decided for the Morphologi G3-ID. We though the audience at Powtech (and already the name suggests this would be more interested in powder analyses then in the colloid and protein sizing characterization capabilites of the Zetasizer Nano ZSP. A bit of uncertainty still remained since at Technopharm this could have been different. But nevertheless we had to choose one and did so. We all hoped and Carl Levoguer the product manager was confident that we have a chance to succeed: “The Morphologi G3-ID is unique. To characterize the particles and then identify just those in more detail you are interested in outstanding performance. It is a great product and we should have a chance to win”. We have been shortlisted with our Morphologi G3 – again amongst the best three! Winning two times and two times shortlisted- what a result! Thinking about it, it makes me proud to be a Malvernee. Why? It shows that we are on the right track with our developments. The systems awarded were chosen by a highly skilled jury. An important criterion for getting onto the short list: the systems must be not older than twelve months and must already be available on the market. The jury judges all entered new products according to the degree of innovation and their practical usability, as well as quality, efficiency and economy for the user. This makes me feel confident. If we can keep up the momentum – what a future! And this Innovation Award 2013 at POWTECH/TechnoPharm is not a local one. It is a well known established award. So I hope a lot of visitors are curious and will come to see us at Powtech Nuremberg Hall 1 stand 357.